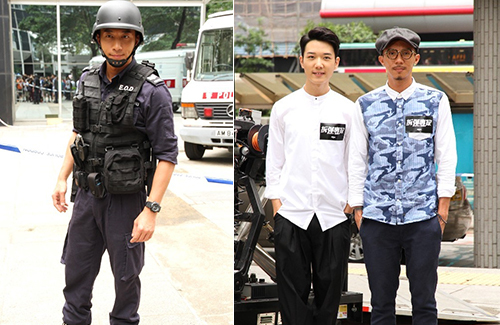 Ron Ng (吳卓羲), who ended his 17-year agency relationship with TVB last year, has been cast in the new Herman Yau (邱禮濤) action flick Shock Wave <拆彈專家>. The $23 million USD movie stars Andy Lau (劉德華) as an undercover explosive ordnance disposal bureau officer who is tasked to capture a criminal bomb specialist. A few days ago, Ron was spotted in Wan Chai filming a bomb explosive scene alongside Louis Cheung (張繼聰) and Babyjohn (蔡瀚億). The 36-year-old former TVB star said Shock Wave is the beginning of a new start for him, sharing that he will continue his career as a Hong Kong film actor in the coming months. To better grasp his character, Ron took a few classes on explosives and detonation theory. He said he is honored to be working alongside many veteran actors in the industry, and jokingly said he wouldn’t mind doing the movie for free. Babyjohn, on the other hand, plays an abducted cop who gets explosives locked onto his body. He hopes that the film would deliver the message that many Hong Kong cops are very willing to protect their citizens.